(January 1, 2010) On the evening of September 22, 1998, the Governor of Wushan County, Cai Jun, was shot and killed in his own home in an attack by an assailant carrying a gun. His wife and their baby weren’t injured, and nothing was taken. On September 22, 1998, Wu Nanfei, wife to the deceased, reported the crime. On the morning of September 25th, while en route to a job in Wanzhou, Tian Tejie confessed to his colleagues, “I killed Cai Jun.” On the afternoon of September 25th, following a court summons, he again confessed, “I killed Cai Jun.” On the 26th, he was taken into custody for criminal behavior and on the 30th of the same month he was officially arrested and sent to the Wanzhou lockup2 and indicted by the Wanzhou prosecutor on the charge of willful murder. For the first trial, Ren Minjie from the Yi’an Legal Office in Chongqing was appointed as counsel for the defendant. An extraordinary phenomenon such as this hadn’t occurred since the founding of new China. It attracted the attention of the Director of the Research Centre in Criminal Law, Chen Guangzhong3, professor at the China University of Political Science and Law, who thought that it was not a simple murder case. In order to clarify the background of the case, and in particular the motive for the murder, Professor Chen engaged the hardheaded senior barrister from Chongqing, Zhao Zelong, who had a reputation for his daring defenses of the common people. Logically speaking, Tian Tejie had no clear motive for this offense. The written statement from the first trial stated that he was under much stress: his parents disapproved of his marriage, the Internet café he was managing was losing money, and his work unit was pressing him to contribute more toward the Housing Establishment Fund4. So pressured, he came up with the idea of robbing the Governor, Cai Jun. But would this explanation hold water? If we say that plunder was the motive, the testimony of Cai Jun’s wife, Wu Nanfei, states that from the time he entered the house until the time he murdered Cai Jun, he never once said a single word about money. Besides which, at the time there was a sum of about twenty to thirty thousand yuan in the desk drawer that Cai Jun had pulled open but Tian hadn’t touched a cent of it, so how could robbery have been the motive? In the end, this convinced Tian to put his thumbprint5 on the appeal document. In order to combat criminal activities and expose the corruption of officials like Cai Jun, the Governor of Wushan County, we are writing to you in the hope that the Central Party Disciplinary Committee will send an honest person to investigate. We need someone of integrity, someone able to imitate Emperor Qianlong’s6 style of investigation by going among the people in plain clothes. That would bring justice to the people. 10. Tian Tejie was an outstanding criminal investigator who had won several awards for tracking down criminals. He was a man of integrity and valued justice, so he could not bear to see Governor Cai and the like spend public funds–the result of the people’s sweat and toil—illegally on their lavish lifestyle. 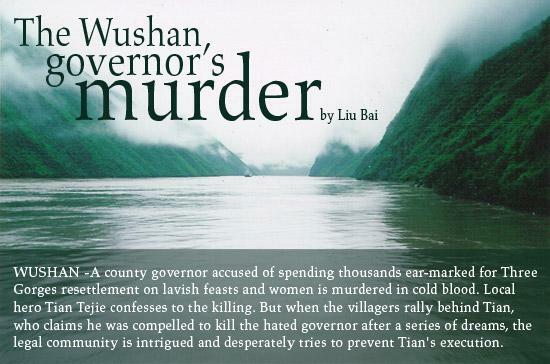 He decided to kill Cai on behalf of the 580,000 people in Wushan. To this day, from government offices to factories and farms, people are still talking about it and they are all saying the same thing: that even death could not expiate all Cai Jun’s crimes and that Tian Tejie was the hero of Wushan. We can see clearly how the people felt about Cai Jun, when a murdered Governor continues to be loathed while his killer is respected as the people’s hero. It reminds us of the respect paid to the People’s Liberation Army when it fought the Kuomintang during the War of Liberation7. We would not have believed that a few corrupt leading officials would arouse such hatred from the people. 14. Leaders in Wushan have not built roads but have instead spent money buying luxury cars. They have bought over 100 top-of-the-line cars such as Toyota Land Cruisers, Mercedes Benz’, Crowns and Mitsubishis, plus dozens of extra ones donated, free of charge, by Guangdong Province.8 Whenever high-up officials came to visit, the local leaders would bring out all the fancy cars to ingratiate themselves with their superiors as much as they could. Ordinary people could do nothing but let out a deep sigh. What sort of way is this for the Communist Party to act? Secretary Liu9, we didn’t dare to inform you directly of the situation and this letter had to be posted from outside Wushan because if it were to be found, it could have disastrous consequences for us. We are risking our lives to inform you of the real facts in Wushan. We earnestly hope you will feel that what is happening in Wushan merits your serious consideration. Translation, editing and online publication of the Three Gorges Oral History Series has been made possible by the Open Society Institute. 1.In 2002, Liu Bai, the pen name of a senior Chinese journalist, interviewed Three Gorges migrants and published their stories in a book entitled The Dream in Three Gorges is Dead. Three Gorges Probe asked Liu Bai to return and re-interview those migrants to update his accounts of their plight. They are presented here in Three Gorges Probe’s oral histories. 2.The “lockup” or “detention house” is where suspects are detained while awaiting trial. 3. Professor Chen Guangzhong is also the president of the Procedural Law Association of the China Society, lifetime professor of the Chinese University of Political Science and Law and PhD supervisor. Other major positions Professor Chen holds include: member of the second, third and fourth Law Appraisal Groups for the Office of the Academic Degrees Committee of the State Council, vice chief of the Law Planning Panel of the National Fund of Philosophy and Social Science, expert adviser to the Chinese Supreme Court of the People and member of the Advisory Committee of the Chinese Supreme Procurator of the People. 4.The Housing Establishment Fund is run within an organization (in this case the county police bureau). Staff make payments to the fund and the money raised is used to build housing for the contributors. 5. A thumbprint is the equivalent of a signature and is standard on legal documents in China. 6. Emperor Qianlong reigned from 1735 to 1796 when he abdicated in favor of his son, but unofficially retained power until his death in 1799. He was rumored to have used undercover investigators to flush out corruption. 7.In 1946, the People’s Liberation Army marched into Sichuan province to liberate the locals from the much larger and more powerful Kuomintang Army. Known as the War of Liberation, it is considered an important battle in China’s democratic revolution. 8.It was national policy that rich provinces and municipalities in coastal areas should support the rebuilding of the Three Gorges reservoir area, whether with financing or equipment. So in some cases, cars were contributed to the counties that would be affected by the dam, especially in the early stages of the population resettlement. 9.Secretary Liu was the head of the Central Party Disciplinary Committee at the time.